Wenlin is software for the Macintosh and MS-Windows operating systems. Wenlin tackles the most frustrating obstacles for students, scholars, and speakers of Chinese with its versatile and easy-to-use interface. It is like having a seasoned scholar on your desktop! 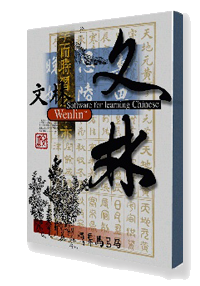 An integrated solution, Wenlin combines a high-speed expandable Chinese dictionary, a full-featured text editor, and unique "flashcard" system all in one intuitive environment. Wenlin is a comprehensive tool for begining students, life-long speakers, and scholars alike. Wenlin includes the ABC English-Chinese / Chinese-English Dictionary edited by John DeFrancis. It has information for over 73,000 characters and 200,000 Chinese words and phrases. Wenlin's unique interface provides instant "point to" vocabulary look-up and "click" access to detailed vocabulary information. Wenlin's extensive character descriptions and cross-referencing include pictures of characters in ancient and modern forms, simple and full form, and pinyin. Wenlin reads, writes, edits, and prints Chinese documents of any size and includes built-in selection of Chinese literature and current media. You can copy and paste Chinese text between Wenlin and other applications. Unicode, GB, Big5, and UTF-8 encodings are supported. Automated drill and review includes scoring, tracking, interactive testing, multiple-choice and composed-answer. Other powerful features include animated stroke-by-stroke display, handwriting recognition, and audio-CD quality studio recordings of all Mandarin syllables. Multi-user packs are available.